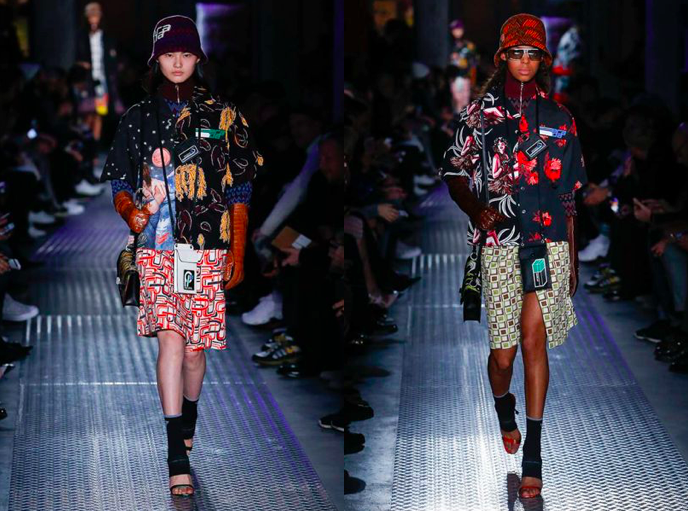 Identity is what Miuccia Prada considers and rethinks the most this season. Well, a house like Prada can boast with a huge number of ‘codes’. But one of the most distinct is the “Pocone” nylon (a modified material that was previously used in packaging industry), which was introduced by her back in 1984 as a line of bags. They were best-sellers in the 80s, and they seem to be hitting the stores by storm with similar success in 2018, noting the current customer tendency for everything that’s nostalgic. This specific nylon was the key material in the opening, all-black looks. From pillow-y coats to bucket hats, it’s a conversation between utility and contemporary dressing. Not only was “Pocone” a Prada reference in this Prada show. Prada’s now-closed sister line, Prada Sport, made a catchy comeback as zippers and labels in signature, bold red. Also, note the prints – feeling a déjà vu? Monkeys, lipsticks, flames, bananas, Hawaii florals, beaches… those are all prints from past collections, remixed and re-matched. 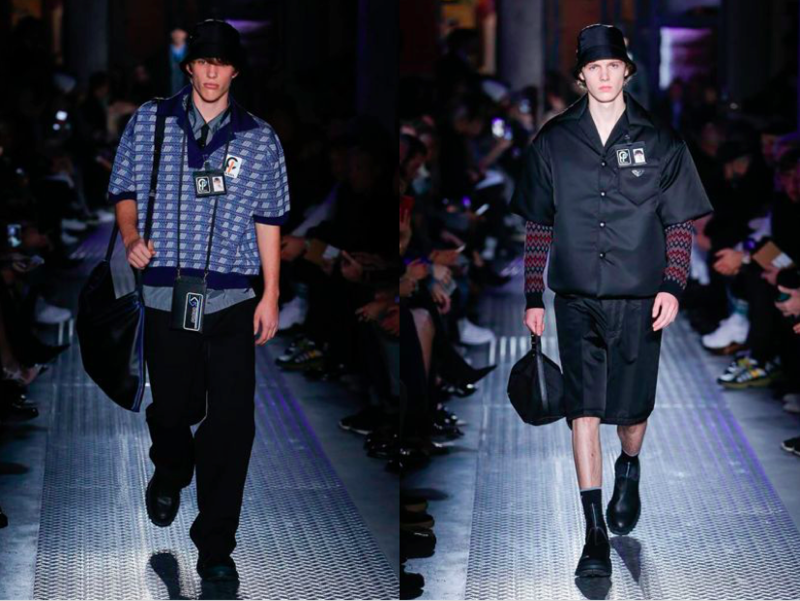 Models wore ID tags featuring cutout Polaroid head shots clipped to their clothes or bags – that brought a exaggerated, corporate feeling that perfectly matched the very industrial venue, so the “Prada Warehouse” of its Fondazione on the outskirts of Milan. A bit elegant, a bit geek – that’s what men’s autumn-winter and women’s pre-fall 2018 really is about, with a dose of Miuccia’s sophistication. 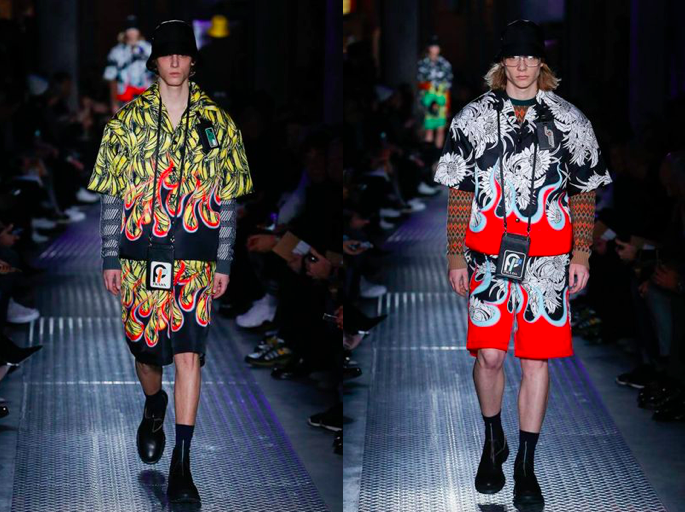 This entry was posted in Menswear, MFW, Trend Reports and tagged AW18, menswear, milan, Prada. Bookmark the permalink.